Jacob Katuva is studying for a PhD at the School of Geography and the Environment, University of Oxford, with a focus of his research on the spatial and temporal impacts of economic growth on the Environment and development pathways in rural Kenya. 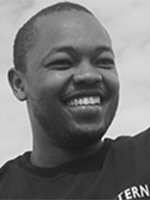 He holds an MSc in Environmental and Biosystems Engineering from the University of Nairobi. During his MSc studies Jacob focused on water resources allocation assessment in the context of mining, irrigation and domestic water requirements. Previously, Jacob spent 4 years working for engineering and development consultancy firm, Rural Focus Ltd, where he gained work experience in hydrological analyses, rainfall-runoff modelling and water balance models. His experience in the water resources management covers water resources assessments, developing and linking Management Information Systems (MIS) and Geographical Information Systems (GIS) and advanced geo-statistics to water resources planning and management as well as hydropower feasibility studies, rural water supply and pollution studies in the context of the mining, irrigation and the water sectors in rural Kenya. He has further experience in evaluation and impact studies of WASH programs.